Cuetzalan is a small town set high in the hills of the Sierra Norte, about three and a half hours from Puebla. Its hot, rainy, humid climate make it incredibly fertile and home to an astounding level of biodiversity. It is known for its strong indigenous traditions and Nahuatl-speaking Totonac Indian population, but tourism has rapidly increased since it was declared a Pueblo Mágico in 2002. The town is named after the exquisite (and almost extinct) quetzal bird, native to Mexico and Central America, who makes its home in cloud forests at high altitude. It’s a beautiful, delicate little creature with plumage of red, green and blue, which was considered sacred by ancient Maya and Aztec people. Most famously, Aztec emperor Moctezuma II (ruler at the time of the Spanish conquest) wore an elaborate headdress of quetzal feathers on a base of gold encrusted with precious stones: it is currently on display at the Museum of Ethnology in Vienna, and the Mexicans are more than miffed about it. The quetzal continues to be the emblem of Cuetzalan, the crest of which inspires the headdress of the local indigenous Quetzal Dance, and this distinctive circular shape is depicted in all sorts of souvenirs sold there from napkin holders to necklaces. Just outside of Cuetzalan is the archaeological site of Yohualichán: it consists of five pre-Hispanic buildings once home to the Totonac people, who were until the 19th century the world’s main producers of vanilla and whose territory stretched right from the highlands of northern Puebla to the coast of Veracruz. Set up on high with spectacular views over the jungle valley below, the site is very impressive. And as we so often find in Mexico, right outside the site is the church built by the Spanish when they arrived and tried to eradicate indigenous Mexican beliefs and traditions. Snakes on display found on the grounds of Yohualichan…mind your step! Also just outside of Cuetzalan is the Jardín Botanical Xoxoctic, a beautiful botanical garden which shows, protects and develops much of the area’s natural wildlife, including an astounding range of orchids, coffee, cinnamon, passion fruit, bamboo. Additionally, there is a wonderful butterfly sanctuary and a tree which ‘bleeds’ red sap, the Sangre de Grado (Dragon’s Blood). The deeply curving roads in the area are nausea-inducing – you’ll need to alleviate your symptoms as soon as you arrive with some of the best local cuisine – tayoyos. Like little squashed dough balls, they are made from maize, filled with a spiced mix of chick pea and avocado, and topped with green or red salsa (or go for both to create the bandera, Mexican flag). 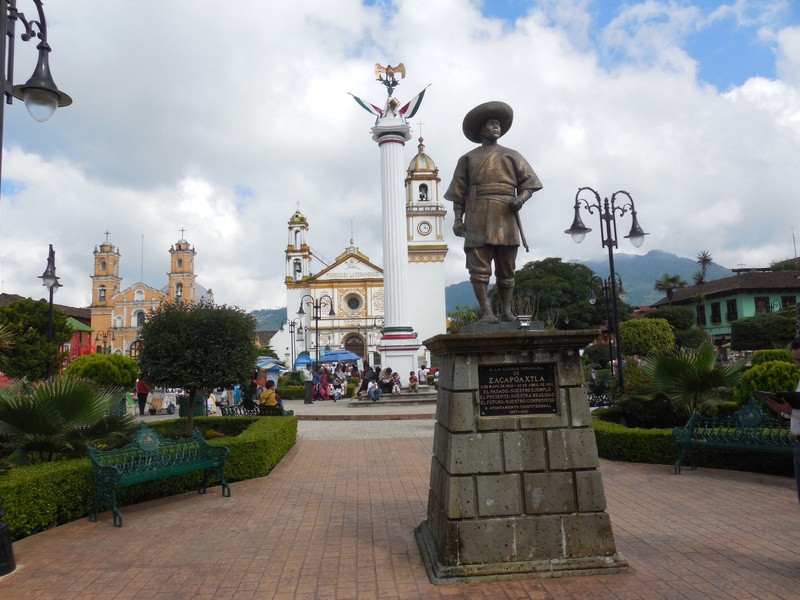 Cuetzalan’s remote location makes its central Zócalo (main square) and Parroquia (parish church) seem particularly impressive, and one wonders how on earth they were built long before proper roads and modern machinery. A big attraction for weekend tourists is the Sunday tianguis, its bustling market. Local people descend from the hills to the town in their thousands to sell their wares, and you can find pretty much anything. There is an amazing variety of handmade souvenirs at very reasonable prices, including lots of jewellery made from coffee beans, hand-embroidered blouses and beautiful rebozos, a kind of traditional Mexican wrapped scarf. A short climb up the steep hillside away from the Zócalo is the church charmingly called Los Jarritos, which means ‘little jugs,’ named after the little jugs which decorate its tower. It is especially lovely to wander the peaceful streets at night when there is a refreshing lack of traffic and minimal light pollution. Just opposite Los Jarritos is the bar Peña Los Jarritos which is a great relaxed hideout for the evening: it hosts its own pole for voladores who perform in the dark amongst the fireflies, making for a truly magical experience. En route home, about two hours from Puebla and one hour from Cuetzalan, is the town of Zacapoaxtla. It is like a smaller, quieter version of Cuetzalan and is famed for the brave contribution its population made to the Batalla Cinco de Mayo. It’s worth stopping by for a wander, toilet stop, and to fill up on tayoyos (again) before heading home. Visitors complain that the ‘original’ Cuetzalan is now little more than a legend owing to the huge boost in tourism it has seen in recent years. This may be true, but there’s no doubt that the increase in visitors provides an important flow of business for the locals, who are able to maintain their life and culture in the hills rather than flock to the cities. Furthermore, they benefit from being able to sell directly to consumers rather than through a middle-man who would take a handsome wedge of the profit. It’s also a fantastic opportunity for Mexicans young and old to escape from the cities and enjoy a slice of the incredibly beautiful nature and wildlife their homeland offers. One of the most important elements of Day of the Dead celebrations in Mexico is the making of an ofrenda – a number of offerings arranged around an altar. Day of the Dead is the time of year when the deceased come back to Earth to visit their friends and family, so Mexicans feel that is very important to do everything they can to firstly facilitate this journey, and secondly give the souls a very warm welcome. The ofrendas vary hugely in size and design, but almost all Mexican families will make one in their home; there are many compulsory components, although these too vary slightly by region. Pre-Conquest Aztecs dedicated most of the month of August to the goddess of death Mictecacihuatl, but the influence of the Catholic Church that arrived with the Spaniards moved it to coincide with All Saints Day on November the 1st and All Souls Day on the 2nd. The current Day of the Dead festivities are therefore a result of ‘spontaneous syncretism’ between Pre-Hispanic celebrations of death and the Catholic tradition of All Saints. It is really interesting to see the different elements mixed together and there are many kinds of ofrendas, some of which have a more religious, indigenous or regional emphasis. For example, the ofrenda at my work was centred on teaching the children about Mexico’s pre-Hispanic traditions (including hot chocolate made from the water used to washed the body of the deceased! ); Puebla’s public ofrendas featured famous Poblano characters and a lot of local talavera pottery; and the ofrendas in Huaquechula had a far more heavily Catholic flavour. Authentic ofrendas (as opposed to those made for tourists) are always dedicated to specific individuals, and the first Day of the Dead after somebody has died there is always a huge party held in their honour; in the following years a smaller ofrenda is made. Cempasúchitl – also known as flor de muerto (flower of the dead), it is the bright orange-yellow marigold which fills the markets and the streets in the run up to and throughout Day of the Dead celebrations. The bright and strongly scented flower is crucial for decorating the altar to make it pretty and colourful; the petals are scattered on the floor around the ofrenda and in a path to the front door in order to guide the deceased to those awaiting them. A glass of water – this is really important for quenching the thirst of the dead, who have had a long and difficult journey from the afterlife back to Earth. Copal – the incense burned at the altar, with the belief that its strong and distinctive aroma calls the spirits. Candles – a number of candles are lit to light the way, again to help the spirits find their home on Earth. Hojaldra – also known as pan de muerto (bread of the dead). There are many types of pan de muerto, but hojaldra is by far the most popular and recognisable for its distinctive shape which represents the tomb, skull and bones. Food and drink – the ofrenda is always decorated with the person’s favourite food and drink. Toys and sweets – if the deceased is a child, toys and sweets are also included to make sure that the spirit feels happy and at home when they visit. The ofrendas are generally installed from the 28th of October to the 2nd of November. The 28th is dedicated to those who died violently or suddenly in accidents; at noon on the 31st the souls of children are awaited; on the 1st of November adults who died naturally are welcomed; and the 2nd of November is the day of graveside vigils when people visit cemeteries in their thousands to clean and decorate the graves, eat their beloveds’ favourite foods, and pass the day and night recalling stories and memories of the lives lost. At work we made an ofrenda to accompany Day of the Dead celebrations with the children, therefore it is a more child-oriented one with lots of sweets, candy and chocolate skulls, brightly coloured papel pikado, sticks of sugar cane and bright flowers. 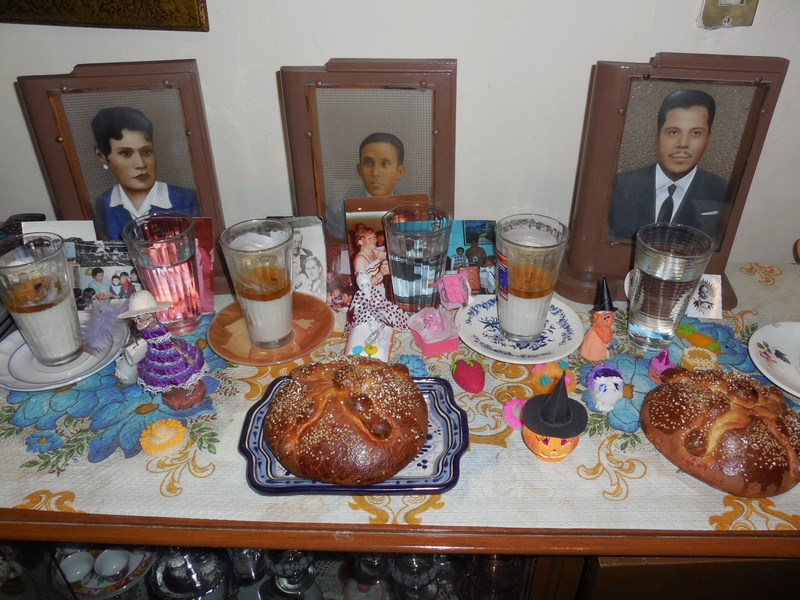 In my house, a far smaller ofrenda was made, typical of those found in the ordinary houses of Puebla. Crucially, it has the photos of loved ones and little trinkets which invoke memories of them (including Sofia, the family dog! ), little sugar versions of their favourite fruit, hojaldra, candles and water. The marigolds are missing, but this is only because the baby in the family was very poorly all week and there wasn’t time to buy them. More public, tourist-friendly ofrendas were made all around the city centre, making a ‘Corredor de Ofrendas‘ in a trail to follow with different themes based on Puebla’s history. These were less traditional but no less impressive. Huaquechula is a small municipality just under an hour away from the city of Puebla, whose ofrendas are famed for their grandeur, bringing tourists from near and far. It is a tradition of the town that each family which has a member who has deceased in that year will make a public ofrenda in their house. This year there were twenty-two deceased and therefore a route of twenty-two altars to visit. They are very proud of this tradition and incredibly hospitable – visitors are offered traditional Mexican refreshments such as agua de tamarindo, agua de jamaica and atole inside the homes. The ofrendas are extremely elaborately decorated according to the gender, age, occupation and personality of the person who has died. They feature more religious aspects such as crying angels, which represent the grieving family; the photo of the deceased is indirectly viewed using a carefully positioned mirror, representing the rift between life and death; and many of their favourite things from clothing to cigarettes. Huaquechula was a really lovely, traditional, tranquil little Mexican town, hosting a former Franciscan convent and a troupe of voladores (‘flying men’). I have already written about voladores, but I saw the best display yet in Huaquechula and managed to get some better photos so I have included them here. As you can see, the size, scale and intention of ofrendas varies hugely, as much as the extent to which people believe that the spirits really do visit. But it doesn’t matter so much whether they do or they don’t, it’s a really lovely way to remember the dead, celebrate their lives, and share the memories. You probably think you don’t know who or what Calavera Catrina is, but I’m sure you do, even if you don’t realise it. Mexican folk art and culture has been becoming more and more well-known in Europe, and the ‘Mexican lady’ is now a popular Halloween fancy dress choice – basically a swishy gothic-looking full length dress, a large hat with even larger feathers, and the all-important skull facepaint embellished with colourful swirly glitter around the eyes. Well this ‘Mexican lady’ is actually an iconic character called Calavera Catrina, the ‘Elegant Skull’. Calavera Catrina originates in a zinc etching by renowned Mexican illustrator José Guadalupe Posada, produced between 1910 and 1913, which were crucial years in the beginning of the Mexican Revolution. It depicts a female skeleton wearing nothing but a flouncy hat in the style of the Mexican aristocracy emanating from European high-society fashion of the moment. The figure bears resemblance to Carmen Romero Rubio, the second wife of Mexican President Porforio Diaz, who’s turbulent time in office created much inspiration for Posada’s satirical critique of Mexican politics. Calavera Catrina is a potrait mocking Mexican natives who Posada felt were shunning their true roots in aspiring to adopt European upper class habits. The Mexican Revolution (1910-1920) crucially led to a new appreciation of Mexico’s indigenous past, and the Calavera Catrina became a poignant symbol of Mexico’s cultural independence from the more recently Eurocentric elite. By the time Diego Rivera included Calavera Catrina in his mural Sueño de una tarde dominical en la Alameda (Dream of a Sunday afternoon along Central Alameda) in 1948, she had become a symbol of the integration of Pre-Hispanic and post-colonial ideals (Rivera’s work is notorious for its almost chaotic and contradictory ideas – he depicted communist ideals and fierce Mexican independence in any one moment, yet was highly criticised for taking commissions from US high society figures the next). Today, however, Calavera Catrina remains an important symbol of Mexican national and cultural identity, no doubt largely because of the importance of skulls and skeletons in Aztec ritual and worship. Puebla hosted a Desfile de Catrinas – a Parade of Catrinas – on Sunday night, which saw hundreds of Poblanas dressed up to the nines flounce through the city centre accompanied by marching bands. Much like Sussex Bonfire Night parades (but without the fire) it also featured lots of glowsticks, devils and mummies; a sign of its inevitable melding with Halloween themes in modern times. As well as the Catrinas and non-Catrina tag-alongs, the parade featured skeletons in all forms, shapes, and sizes. The generic name calaca is a colloquial term for skeleton in Mexican Spanish, given to the joyous skeletal figure that adorns everything around Day of the Dead. They can take male, female, or animal form (dogs are especially popular), and they’re usually in traditional Mexican costume and undertaking some kind of fun activity such as playing an instrument, singing or dancing. The jolly figurines (made of anything and everything) give the impression that the afterlife for Mexicans is just as much of a riot as the life of the living. Joy and laughter form such an integral part of Mexican life, why would the emphasis placed on pleasure and parties after death be any different? Calavera translates as skull – they’re absolutely everywhere at this time of year and are undoubtedly the biggest symbol of Day of the Dead in Mexico. The skull obviously represents the dead, only the skulls and skeletons that adorn everything here are not grim, vacant figures at all, but jolly personalities always smiling or laughing and very often in character, for example in traditional Mexican dress, or as a nurse or mariachi musician. Mexico’s sugar and chocolate skulls are an internationally recognised symbol of Day of the Dead, and they are always brightly coloured and decorated, again demonstrating the fun of the celebration. There’s nothing haunting or spooky about the tradition, it’s about welcoming back loved ones who have died, who are only able to visit at this time each year. In the UK we are much more uncomfortable with death, and rarely laugh at it. For that reason Day of the Dead can be misinterpreted as a little creepy and weird. However, once it is understood within the context of the Mexican culture and character it becomes apparent that it’s just an alternative way of dealing with the same emotions (of the universal experience of death), in a style that is more fitting with the Mexican approach to things in general. Mexican humour is very dark and clever, full of double entendre, and they do tend to laugh at everything no matter how disastrous, so it completely makes sense that the Mexicans take one of the most difficult and painful human experiences and spin it into something entertaining and fun. As calavera means skull, calaverita just means little skull. Following in the traditional of double meaning in Mexican language (which can be very confusing for outsiders! ), calaverita also refers to a special kind of poem which is written and shared around Day of the Dead. They are humorous rhymes which detail a prophecy of how a person is going to die. A few of my sprogs at work wrote me this Calaverita, it had me in stitches and I had to share it! acompañada de un viejo pelón. se la llevó con todo y ropa. There was Teacher Ellie eating a chunk of melon, when Death arrived accompanied by a bald old man. “What are you doing?” Death asked her. “I’m killing my hunger,” Ellie answered. “Killing? !” she exclaimed, “she wants to compete with me,” thought Lady Death. “But hastiness won’t get the better of me,” she consoled herself. And just like that poor Ellie died, and never returned to Europe, because evil death took her with clothes and all. In Juconi the children cried, but they forgot her in a jiffy, because in the end, after everything, nobody understood her English.